My son's friend broke his leg playing hockey recently, and today will be his first day back to school. Lance wanted to give him a card, but something different than the usual Get Well type. He chose this cutie penguin from the Cool Yule set from My Favorite Things. I made a Tent Topper Card, and used some Frost paper (Memory Box) for the background. 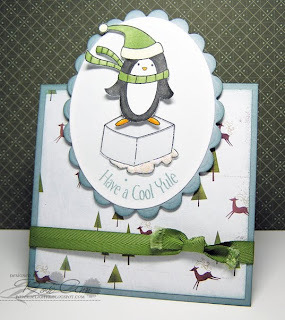 The ice block was stamped onto clear card stock with StazOn ink, then trimmed out. The snow is created with Liquid Appliqué and sprinkled with Dazzling Diamonds. Thanks for stopping by, and Happy Weekend!! So fun Rose Ann, ADORABLE. That's a great card! It's just adorable and sparkly! That is so, so sweet that your son wants to send his friend a card! I really like the ice all blinged up, too! Cute card, Rose Ann! Ha ha! How fun is this? I need to make a tent topper now! 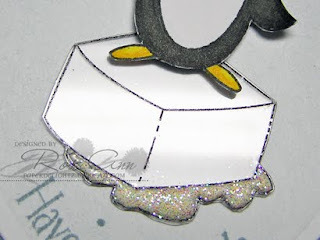 What a very sweet looking image of the penguin on the ice and the little hint of glaze that you created at the bottom! How neat of your son to want to give this to his friend, I think it's perfect for a boy to give to another boy! Hope he's back to 100% soon! What a sweet card, not only in looks (OMG, it's perfect!) but for the intended recipient! VERY cool card. He'll love it! I REALLY need to try the LA and dazzling diamonds combo...LOVE the look of that! Very cool ice block! The shine is perfect. This is so sweet Rose Ann! I am sure that Lance's friend loved this!!! Hee hee so cute Rose Ann, he looks like he'll be slip sliding to fun! Your son is very thoughtful...and this is a darling card for him to give...love the sparkly Rose Ann!!! Your tent topper cards always rock! This one is sure to put a smile on that young boys face! Super cute! Fabulous RoseAnne!! Sorry I haven't been by in awhile... Phew its been a busy week. Hey girlie .. Love your Christmas card sooo AWESOME!! Thank you so much .. Can you call me Please? I am so sorry about your DS's friend, Rose Ann...this adorable and fun holiday card will lift his spirits, for sure!!! Have a wonderful Christmas!!!! Cool card for a boy! This is just so sweet and thoughtful. What a darling card, Rose Ann. This is such a cute card! Love the glittery ice! Hope you had a wonderful holiday! How cool is this !! Great card Rose Ann ! Awww, sooo CUTE Rose Ann! Hope you have a wonderful NEW YEAR ahead!! Fabulous card Rose Ann! I love the ice block and snow. Merry belated Christmas and Happy New Year.